A recent trip to Newport, RI, sent us right through what is purported to be the pizza capital of New England. Yay for me. New Haven, CT, is conveniently located right off of Interstate 95. Easy off, easy on. This fact pretty much answered the question of "where are we stopping to eat on the way to Newport" as well as "where are we stopping to eat on the way back from Newport." 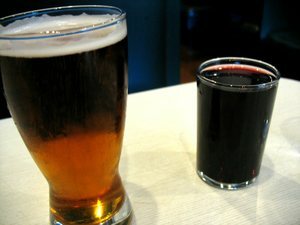 After some extensive googling we determined that there are many other options, and the dividing lines are clearly drawn. Everyone has their favorite and thinks their not-favorite "isn't as good as it used to be." Oh for eff's sake. We settled on Modern Apizza on the way up, and Frank Pepe's on the way back. 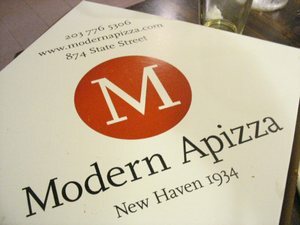 It was about 1.30 on a Friday afternoon when we rolled into New Haven and into Modern's parking lot. The place was pretty much full. We sat ourselves at one of the last available tables, wondering if that's what we were supposed to do. That seemed to work out and we immediately ordered a "medium" mozzarella pizza, half pepperoni. The "medium" pizza was pretty damned big, and most of it ended up on our hotel room floor in Newport for the remainder of the weekend. Come to think of it I think it was there as we were checking out. Anyway, the fact that we didn't finish the thing had everything to do with the size and nothing to do with the flavor, which was excellent. The crust was excellent and had showed signs of some nice oven spring. A napkin was used to sop up extra grease. Random aside: Modern Apizza gets props for giving us a big ol' pitcher of ice water. On the way back we stopped at Frank Pepe's. Again, as one might expect, the place was absolutely packed. This time on a Sunday at 2 pm. We went for two small pizzas: a tomato pie (that's what they call them at Frank Pepe) with mozzarella, and one of the famous white clam pies. The clam pie was bursting with garlic and salt and clams. A real assertive pizza. The clams were chopped finely for the most part, and were clearly from some big ol' clams. It was a real winner. The pie with mozzarella was very good as well. It was much less salty (and more greasy) than the white clam pie, and probably should have been eaten first (it wasn't). Neither pie had any appreciable oven spring. However, just as with Modern, the crust was quite good. Nice and charred and chewy. Random aside: Frank Pepe gets props for having a really really big brick oven and local-ish beer on tap. The wine glass, however, was just plain silly. Overall, I found the crust at the Modern to be much more interesting and developed. For me, pizza is almost completely about the crust. 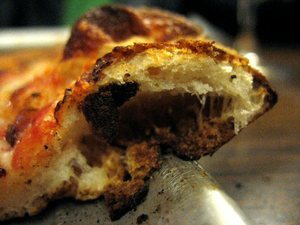 Pizza is first and foremost bread, and a chewy, charred crust with great developed flavor is essential for a pizza aiming for the stars. Both places served an incredibly greasy pizza. I don't think this was due to the addition of extra virgin olive oil, but rather the cheese is filled with grease. It was so greasy that I couldn't help but think it would have been much better at 11 at night, rather than for lunch. It's usually cooked in coal-burning ovens, like most of the old-skool places in NYC and Brooklyn. The sauce is nothing special, although it shouldn't be: it should be crushed tomatoes. At NYC's famed brick oven pizzerias, and even at New Jersey's own Brooklyn's Brick Oven pizza (Ridgewood, Edgewater, Hackensack), which is related to NYC's Grimaldi's by family and shares the same approach, fresh mozzarella is the cheese of choice. 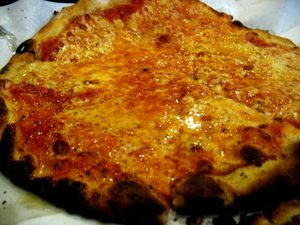 In New Haven, at least in my experience, they're using a somewhat standard grated cheese that you'd find on pizza at any mall around the country (although Modern offers fresh mozzarella on their "Margarita"). 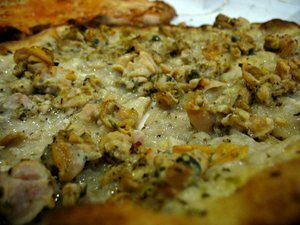 What sets New Haven pizza apart to my mind is the fact that the crust is exceptional. 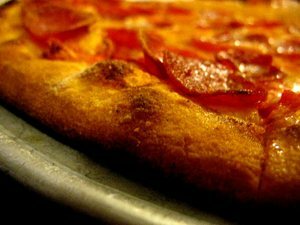 With the combination of somewhat unremarkable ingredients and exceptional crust, New Haven pizza sits in a space of its own: it's not the NYC/Brooklyn/Neapolitan-style pizza, it's not your local pizza joint with a lame crust, but rather it's a combination of both. It's a greasy pizza with standard pizzeria cheese and a really good chewy charred smoky crust. Like the best non-Neapolitan-style pizza you've ever had. New Haven is about 1.5 hours from the GWB and Tappan Zee. Note: Please don't email me or post a comment that I picked the wrong places and that "[fill in your favorite here] is way better", because I've already been through that with everyone person I've mentioned this trip to, I didn't want to hear it then, and I still don't. Note: This post and its contents have not been checked for accuracy, spelling, punctuation, continuity, or grammar, and most likely won't, especially since you've already read it.